An MP who was jailed for lying about a speeding offence is to face a tribunal to determine if she is fit to practise as a solicitor. 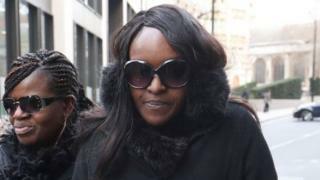 Fiona Onasanya, 35, was convicted of perverting the course of justice in December and expelled from the Labour Party. She is currently an Independent MP for Peterborough. She is accused of "failing to act with integrity" and has been referred to the Solicitors Disciplinary Tribunal. The hearing is to take place in August. The Solicitors Regulation Authority said Ms Onasanya was also accused of failing to uphold the proper administration of justice and failing to behave in a way that maintains the trust the public places in the provision of legal services. The BBC has contacted her for a response. Ms Onasanya became the first sitting MP to be jailed since 1991 when she was sentenced to three months in prison in January. She was released the following month. The MP had denied being behind the wheel when her car was spotted being driven at 41mph in a 30mph zone, in July 2017. Her brother Festus was jailed for 10 months for perverting the course of justice after he falsely filled out her Notice of Intended Prosecution. A recall petition has been launched to decide whether Ms Onasanya can continue sitting as an MP.